The rivalry between quarterbacks selected in picks one-two in the NFL Draft dates back to 1971 when the Boston Patriots selected Jim Plunkett over Archie Manning. As the years go by, the debate gets bigger. Which quarterback will be a success and which one will be a bust? This year’s draft marked the seventh time that quarterbacks would go in the first two picks. NFL executives and scouts can watch as much film as they like, but do they ever truly know if a quarterback out of college will be great? A lot of this comes down to luck as draft busts are becoming more common. Let’s explore some other one-two quarterback picks and see how it shaped the future of their respective franchises. The original quarterbacks taken back-to-back were Jim Plunkett, the first pick selected by the Boston Patriots and Archi Manning, chosen by the New Orleans Saints. 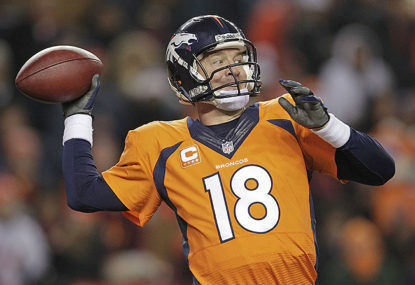 Manning was a better quarterback than Plunkett, however, Plunkett had more success. After four seasons at the Patriots, Plunkett was traded to the San Francisco 49ers and released after his first year. He landed at the Oakland Raiders were he started off as a back-up. When starting quarterback Dan Pastorini fractured his leg Plunkett got his opportunity to play. He won two Super Bowls with the Oakland Raiders and was named Super Bowl MVP in 1981. Archie Manning played his career in a poor team and could have been great if he was surrounded by the right people. He was sacked 340 times while playing at the Saints and his record as a starter was 35-101-3. He was selected to two Pro Bowls and was the NFC Offensive Player of the Year in 1978. Drew Bledsoe, the first pick in the 1993 Draft, resurrected a struggling New England Patriots and took them back to the Playoffs on multiple occasions. Bledsoe suffered a sheared blood vessel in the second game of the 2001 season and lost his starting job to back-up quarterback Tom Brady who went on to win the Super Bowl that year. The next season Bledsoe was traded to the Buffalo Bills where he spent two seasons before being traded to the Dallas Cowboys. Second pick Rick Mirer only lasted three seasons at the Seattle Seahawks before being traded to the Chicago Bears and ended up playing for seven NFL teams during his career. He was criticised for his lack of intelligence and widely regarded as one of the biggest busts in NFL history. The most famous one-two combination was the 1998 NFL Draft when the Indianapolis Colts selected Peyton Manning over Ryan Leaf. Ironically, the scouts couldn’t separate both players as they were incredible in their respective College careers. Lucky for the Colts, they went with their gut and selected Manning, who will go down as arguably the greatest quarterback to ever play the game and delivered them a Super Bowl. Leaf will be remembered for the biggest draft bust in NFL history – his is a very sad story. His career started poorly and he never recovered. After his rookie year he missed the 1999 season due to a shoulder injury and was later released by the San Diego Chargers. Post career Leaf became a drug addict, attempted suicide and is currently spending time in jail. In December 2012, Leaf pleaded guilty for burglary and drug possession in Montana and was sentenced to seven years in a state prison. Tim Couch was drafted to the Cleveland Browns with the first overall pick in the 1999 Draft. He suffered many injuries including a broken thumb and a broken leg due to the inexperience of his offensive line. Couch was a draft bust and only lasted five seasons at the Browns before being traded to the Packers in 2004 where he failed to make the 53-man roster. Three years later he signed with the Jacksonville Jaguars as the third string quarterback but was later released. Donovan McNabb, selected as the second pick by the Philadelphia Eagles led the team to the Playoffs over eight seasons, falling painstakingly short of achieving the ultimate success by losing Super Bowl XXXIX to Bill Belichick and the New England Patriots. McNabb made six Pro Bowls and was named NFC Offensive Player of the Year in the 2004 season having a successful career. Andrew Luck was selected with the first pick in the 2012 draft by the Indianapolis Colts and Robert Griffin III was selected as the second pick by the Washington Redskins. While RGIII was elite in his rookie season, he has failed to live up to expectations and had an injury prone career. He failed to gain the respect of his locker room and spent his last year’s as the third string quarterback. During the offseason the Redskins traded him to the Cleveland Browns. He now finds himself on the Physically Unable to Perform (PUP) list after suffering a ten week should injury in Week 1. Andrew Luck is widely regarded as the best quarterback in the NFL. If you were to build a prototype quarterback, then Luck would be it. He is extremely tough, has the ability to extend plays, is smart and a great teammate. Luck has taken his team to the Playoffs on three occasions. Providing the Colts can build an offensive line around him Luck may go down as one of the greatest quarterbacks to ever play the game. He will be a future Hall of Famer. Good call, Colts! Jameis Winston was drafted as the first pick to the Tampa Bay Buccaneers and Marcus Mariota was selected second by the Tennessee Titans in the 2015 NFL Draft. They both have two very different styles. Winston is a pocket passer who has had a chequered past and was the subject of sexual assault claims during his time at College. His character has been questionable. However, he is a football nerd and has a work ethic that rivals the best. Mariota is an athletic quarterback and is his most potent while scrambling outside the pocket. He has a quick release but has a lot to learn. He came from a simple College system and time will tell if he has the mental capacity to become an elite player. Jared Goff was selected as the first pick in the 2016 NFL Draft and although it is too early to determine if he will be a success or not, what is evident is the lack of maturity. He seems to be the joker of the team, not the leader. He is the third-string quarterback on the Rams roster which is a little concerning and proves how much work needs to be done if he is to be successful. Conversely, Carson Wentz is the opposite. He is disciplined and mature beyond his years. He has all the hallmarks of a great leader. He has so much presence in the pocket, is extremely tough and can make all the throws. He has the ability to be elite and a franchise quarterback. The success of a first round draft pick is the difference between a franchise winning a Super Bowl and becoming relevant again, or continuing to be the laughing stock of the NFL. The stakes are high and one incorrect decision can be disastrous.